Hellen Keller, Charlie Chaplin and John Lennon; what do they all have in common? 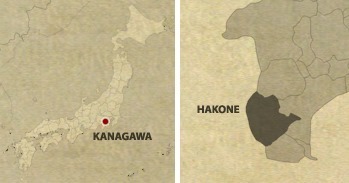 They all stayed at Hakone’s Fujiya Hotel. And that said hotel was our last stop for our second day in Japan. Coolness! I can see from the fog-ridden landscapes of the resort that this is no ordinary hotel. 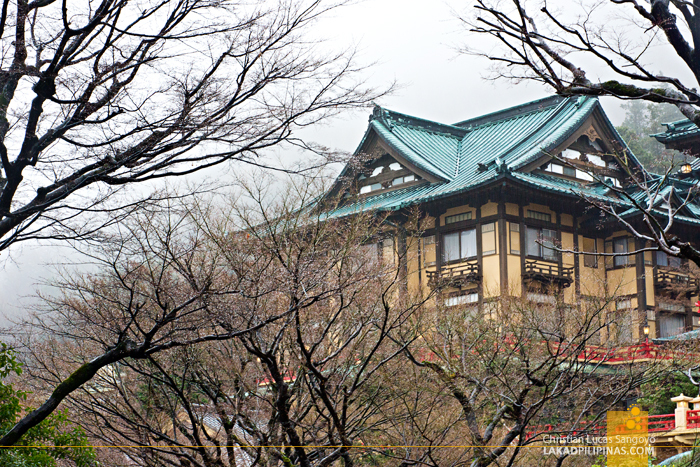 The architecture is different, still distinctly Japanese but with hints of western influences. 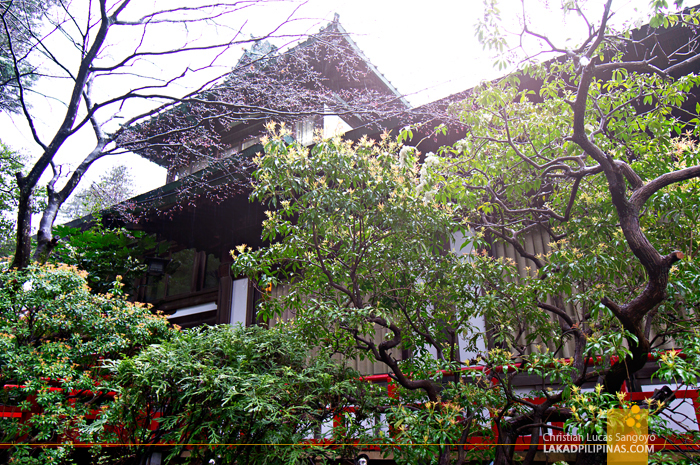 It looked like a modernist take on the country’s traditional architecture, but somehow, you know that it’s all authentic. 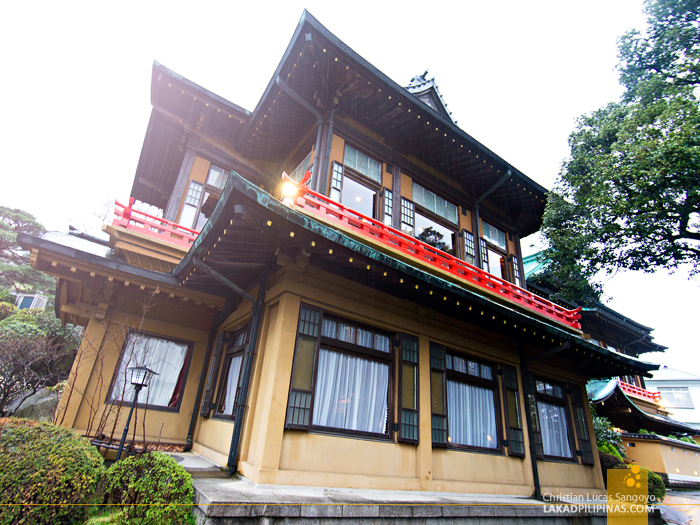 Fujiya Hotel was built in 1891, it is that old, and it has seen its fair share of history. The hippie guru John Lennon and his equally eccentric wife Yoko Ono among other notable personalities have made this hotel their home for a few nights, it became a refuge during the Second World War and a Nazi Gestapo leader was even cornered here decades after the war. We arrived at its gate at around noontime but the sun was nowhere to be found. They said one can view the majestic Mount Fuji from here but all we were able to see were a monochrome blanket of flat grey clouds. 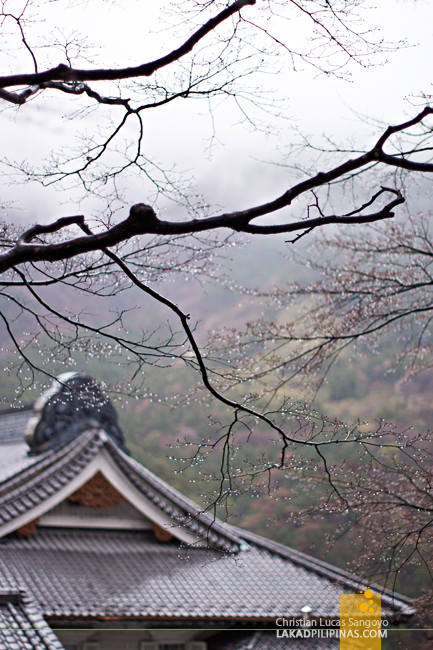 The pavement was wet from the rain and mists were slowly swirling around the bare branches of the Cherry trees surrounding the property. The hotel is absolutely gorgeous. The walls are painted in earthly yellows accented by red balustrades. 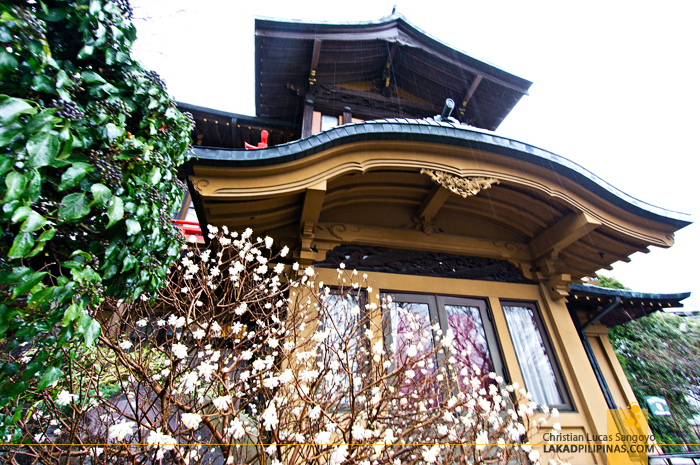 The windows were all very modern but the roofs were all gracefully Japanese; curving and soaring high above with its wide eaves and multiple dormers. Lush landscapes surround the buildings. Trimmed hedges and equally wild trees stand side by side. 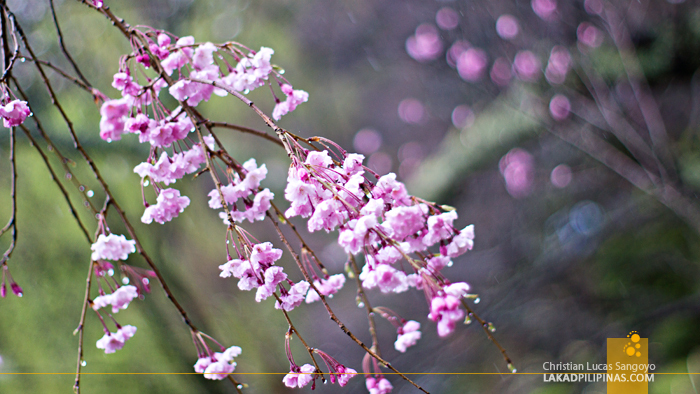 Cherry blossoms shine in pinks, cheerfully blooming against the gray weather. 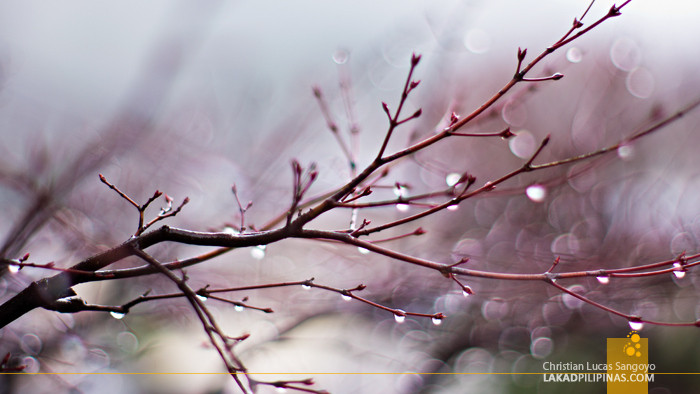 Bare deciduous trees glisten, dews sparkling preciously from its thinnest branches. Warmth enveloped us as we proceeded inside. 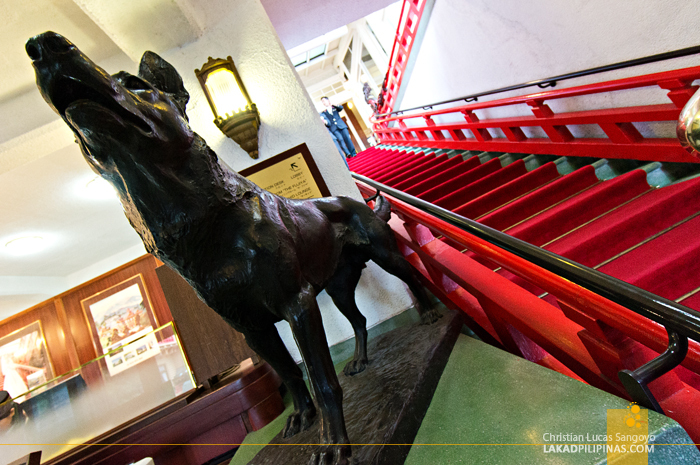 A sculpture of a dog stands guard over the lobby; Hachiko perhaps? Well I’m not really sure. The place was packed with guests lounging about and enjoying their late lunch. The view from the second level is amazing; it’s just too bad that Mount Fuji is in hiding. 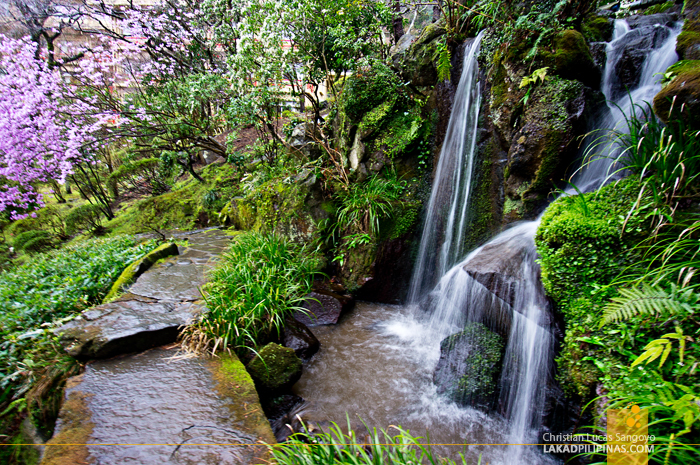 Numerous small waterfalls and koi ponds swimming with huge colorful fishes litter the back garden of the hotel. 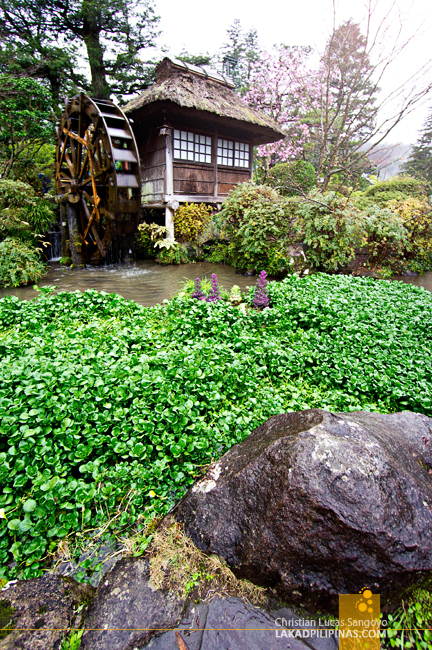 A maze of stone trails wound its way through numerous gardens. It was all very confusing so I let my feet choose where to tread. A watermill stopped me on my tracks. I’ve read about it in books, I’ve seen it on the telly, but I haven’t seen something like it in person, ever. A real working waterwheel scooping buckets of water from a murky pond. 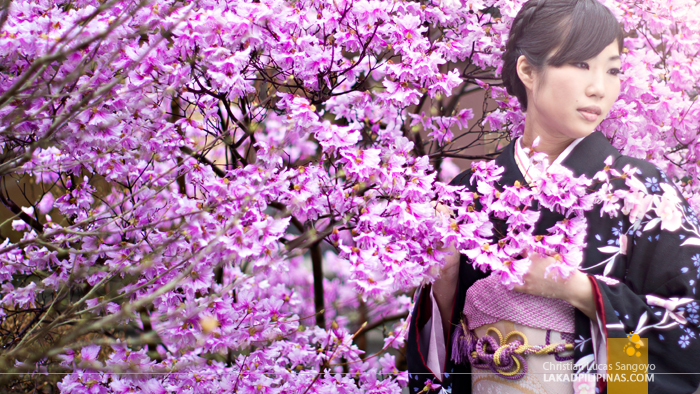 A rain of cherry blossoms fell and I continued my journey. I lost sight of my companions but I kept on. My feet slowly following a wet stone path. Trails lead to places and I wanted to see those places. I was alone and I can see that the path my feet chose led to an old Japanese shed. A dead end? But perhaps not. I can see just a hint of stairs, narrow and made of stone, descending down. I was thinking of turning back, I felt alone in this strange place. But my feet seemed to have other plans. It strode forward and took steps towards the stairs. A dead end. But my eyes caught something beyond the bushes. I brushed the thicket aside and found a lone and deserted temple. This set reminds me of the Takeshi Kitano film, "Dolls." Ganda!